Butler freshman Sam Deemer swims the 200 individual medley against Mars Thursday night. Deemer and fellow freshman David Bocci have sparked the Golden Tornado boys team this season. BUTLER TWP — There was no need for freshman swimmers David Bocci and Sam Deemer to spend time getting their feet wet. They took care of that long ago. The two came up together in youth swimming and have earned a bevy of medals for the Butler Barracudas YMCA swim team. David Bocci and Sam Deemer were at it again Thursday night. 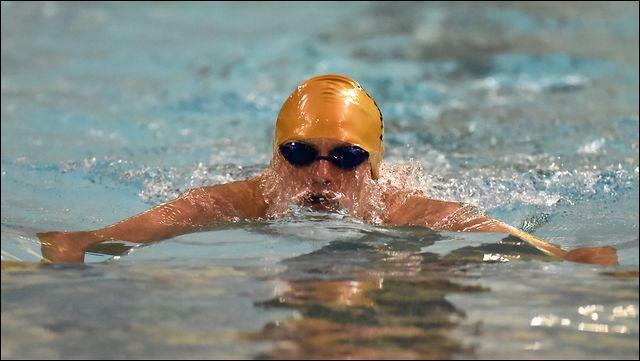 Bocci won the 100-yard freestyle and backstroke events and Deemer the 200 individual medley and butterfly as the Golden Tornado improved to 3-0 on the season with a 92-71 home victory over Mars. The duo have been teammates since competing at the 8-under level. They have already qualified for WPIALs in six individual events apiece. Deemer is the last of four brothers to swim at Butler. Ryan and Joe have both graduated and Alex, a junior, is a leader on this year's team who won the 200 and 500 freestyle events Thursday. Butler's Jon Hansotte had a solid night in diving, winning the competition with a score of 256.75. Andrew Ivory earned the lone individual win for Mars (2-3), placing first in the breaststroke. Butler's girls won six of the first seven events to spark a 95-89 victory over the Planets (3-2). Star sophomore Laura Goettler delivered wins in the 200 IM and 100 freestyle for the Tornado (2-1) and several other swimmers gave Dave Bocci reason to smile. Rachel Ledford made the cut for the WPIAL meet in the backstroke, winning the event in 1:02.77. The WPIAL time is 1:03. Freshman Abbie Griffith won the 200 freestyle and butterfly. Paige Williams earned for the Tornado a win in diving with a score of 241.75. Mars sophomore Caroline Stamper is the only Planet girl back who competed at WPIALs (50 freestyle) last season. She and Madeline Gagnon (500 freestyle) were Mars' winners against Butler. Despite not being 100 percent, Stamper has had a strong showing so far. “She's been amazing,” said Mars assistant coach Mitch Schall. “Obviously, swimmers want to do their best in March (districts and states), but Caroline has put up some really good times so far. 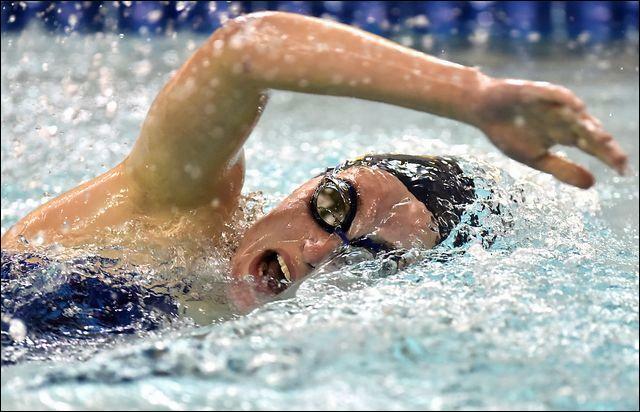 Mars swimmer Jenna Halenda swims the 200 freestyle against Butler on Thursday. She finished second in the event.